This nice independent house is on the top part of an ancient building That dates back to the eighteen century. From the street level with stairs of about 120 steps leads to the first floor entrance. The living room is furnished with a tasteful mix of antique and modern furniture. It features a comfortable sofa, a fireplace and a folding table. On the same floor, there is a little but well equipped kitchen and a bath. An internal staircase leads to the second floor where there is the sleeping area That Consists in two double bedrooms and a bath. Also the house features a huge terrace full of potted flowers and other plants That enjoys a terrific sea view. It is partially covered by a pergola with a shadowed bouganvillae Allowing the guests to dine al fresco enjoying the sea view. 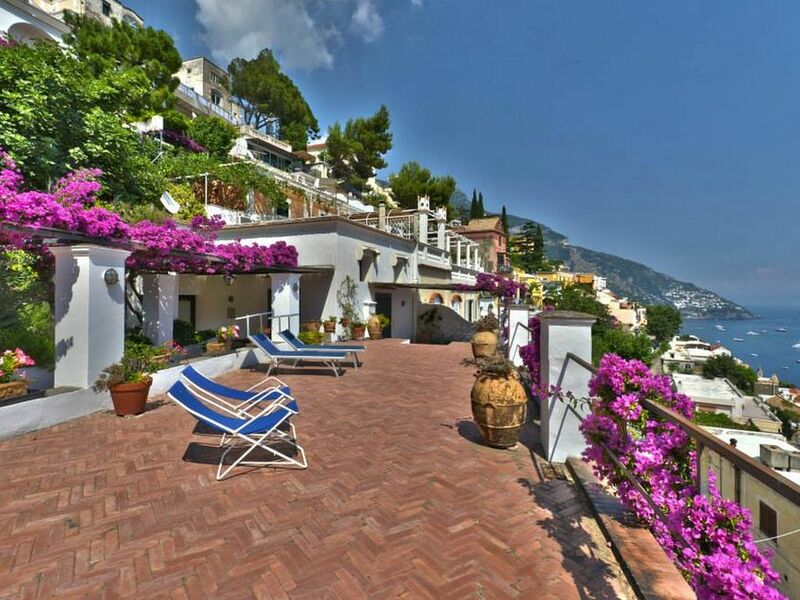 Its central location allows guests to easily reach shops, restaurants and the pedestrian zone of Positano. One or two services are included in the rates. Additional cleanings and linen / changes can be arranged for a fee. Food shopping service is available at a fee. We had a great stay! Francesco was always on the ball for communication and the house was exactly as described. The patio is stunning and the view is top notch. Centrally located about halfway up the stairs, it's a nice middle ground. The bodega up the street was our favorite spot and had all the provisions we could have needed. Would definitely stay here when we returned to Positano! We loved our stay in Positano and Francesco's place was perfect. Yes there are a lot of steps going up to the place but in comparison to the rest of the town, it felt like nothing. If lots of steps are a concern, then staying in Positano in general is probably not a good idea. The view off the terrace was amazing! We spent our mornings and nights sitting up there and just taking in the views. Francesco was very welcoming and offered a list of local restaurants and even contact information for each. He helped arranged our transfer back to the train station and even offered to help set up a boat trip to Capri (they were booked when we finally made a decision but we appreciated the offer). I would 100% recommend staying here and if we are lucky enough to return to Positano, I would stay here again in a heartbeat. Beautiful historic home with views of it all. This home offered everything imaginable - huge bi-level terrace with sweeping views of both the city and the sea, flowers and potted plants and a lemon tree ripe with lemons as well as bougainvillea everywhere. Comfortable and historically decorated home that met all our needs. Wonderful staff that offered help with everything including highlights of Positano and connections for private tours. This home is a gem which we would most definitely return to. Positano is a village of 4000 Inhabitants in the heart of the Amalfi Coast. Thanks to the mild climate and the beauty of the landscape, Positano Has Been a resort since the days of the Roman Empire, as attested by the discovery of a villa and more recent discoveries, dating to 2004. Typical of the many "steps" from the country That come down to the beach. The main beaches are the "Great beach" and the beach of "Fornillo", both Within walking distance, others are La Porta, Arienzo and Laurito, all Mainly accessible by boat starting from Positano. Also it is Famous for his fashion. The nearest bus stop is few meters from the property. In a range of 300 meters, there are several restaurants, a grocery, a wine shop, a laundry and three private car parks.